Cute and funny! Care for your very own Tiny Bear and show your friends! Help your Tiny Bear grow into a multitude of hilarious evolutions! More addictive that mail, chat, or forums! Kill your free time with this free collection game! ◆ Addictive, feel-good actions! Your Tiny Bear loves to eat apples! 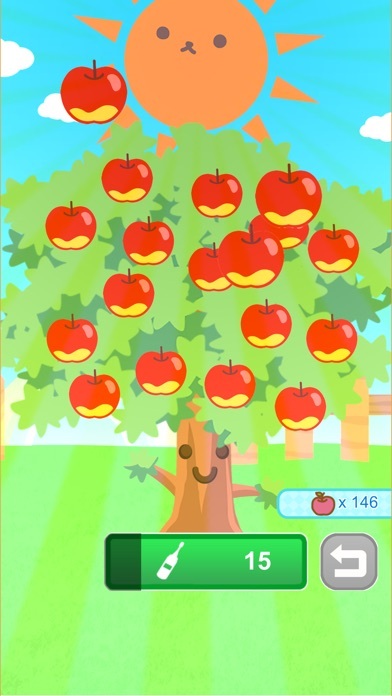 Harvest them from the tree in one fell swoop! Swipe, swipe, swipe! It feels so good! ◆ Exciting Evolutions! As your bear levels up it evolves into many different forms! Familiar hair styles and motifs abound! There are so many different looks! ◆ Complete your collection! 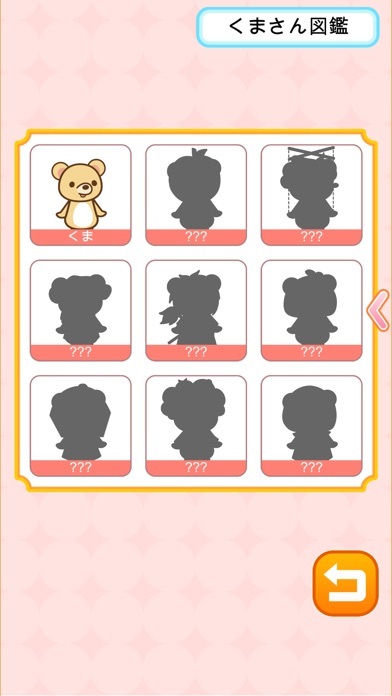 There are 20 different Tiny Bears to be unlocked! Change the items in your Tiny Bear's room to change its appearance! ◆ Take care of your Tiny Bear each day! Don't leave your Tiny Bear for too long; if you don't pay attention to it, it will get bored and become distant! If you see hearts be sure to collect them! You'll earn PP (Pet Points) in doing so! Simple game system! Not that good at action games? Don't worry; this light game is so easy to pick up! Great for kids and adults of all ages; the healing feeling of looking after a virtual bear is simple for anyone! 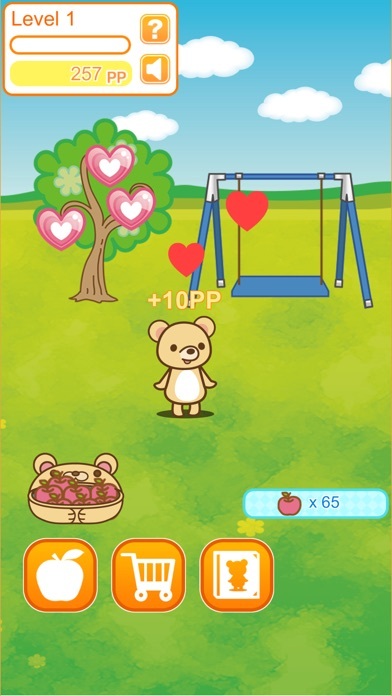 ◆ How to raise your Tiny Bear ◆ ○ 1 Your Tiny Bear loves to eat apples! First, harvest apples from the tree! Use Supa-Gro Tonic to increase the speed at which your apples grow! ○ 2 Return to the room and you'll see apples in the basket! Tap it to see your Tiny Bear eat some apples! How cute! If you run out of apples, head back to the tree to harvest some more! ○ 3 Play with your Tiny Bear! Petting your Tiny Bear and playing on the swing gains you PP (Pet Points) that allow you to buy new items for your Tiny Bear's room! ○ 4 Change out the items in the room! Use PP to buy items for your Tiny Bear's room, and even new room styles! Change around the items in the room, get your Tiny Bear to eat apples, and eventually…?! ○ 5 …your Tiny Bear will evolve! Change the items in the room feed your Tiny Bear apples to make it level up! There are lots of funny and surreal evolutions! Try to find them all! ◆ Recommended for ◆ Filling the gap on the commute to school or work, waiting for the train or bus… Want to have your own pet but can't? Why not keep a Kitten! People wanting the relaxation gained from owning a pet; take a break! ESPECIALLY if you love afros! Anyone wanting to play a free game! The Afro series of games has proven to be popular with men, women, boys, and girls alike! Share the funny pictures on Twitter, Facebook, or LINE! Did you enjoy collecting Hamsters, Alpacas, Mushrooms, and other Funghi? Remember those Tamagotchis from the 90s? You're in for a treat! The game will be better if you fix it!!!! This game is super cute! But there is a slight problem ; there are no texts what so ever. Even tho I do have the other games, I still won't know what it's saying. Please fix this problem! Just got this the other day and it's a great app but there are no labels! Like I can't see how many apples I have or how many pet points I have or even what level I'm on! OMG THIS GAME IS SOOOOO KAWAII!!!!! Really cute, needs more stuff to do! I love the graphics and quirkiness of the whole idea. I wish there were more options and generally just more!